I spotted this likely looking joint on the way out to Lake Fork. When my fishin' guide also recommended it, I made sure to stop on the way home. From the outside it looks like your average "good ol' joint", complete with a parking area full of pickups and a hearty aroma of wood smoke wafting around from the back. Inside a nice little lady took my order and shortly came back with a plate full of food for $12. The ribs were massive and at first I thought they might have been beef ribs. Nope, just big pork ribs. 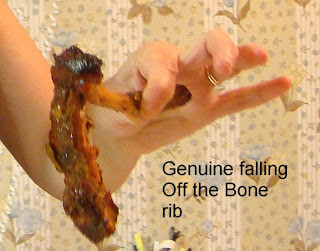 Most of each rib was pretty tender without any noticeable smoke flavor. They were piping hot, fresh off the grill. A few spots were chewy, but there was a lot of pig to eat and it was pretty tasty. The brisket was plastic fork tender and easily fell apart when poked. While most of it got "sauced", a little excavating showed only a little smoke ring on an unsauced sample. There was almost no smoke flavor, either, which was somewhat disappointing considering the generous amount of wood smoke outside. The hot links were standard East Texas hot links in the bright red casing. Not very spicy and more like big hot dogs. The tater salad was a nice tangy mustard variety and pretty tasty. The sauce was an average tomato sauce of the sweet variety. I stopped by again on my next trip to Lake Fork and bought a pound and a half of their sliced brisket. It was as tender and moist as my first trip but still needed sauce for flavor. My choice this time was Dr Pepper BBQ sauce and that combo made for some dynamite sandwiches. 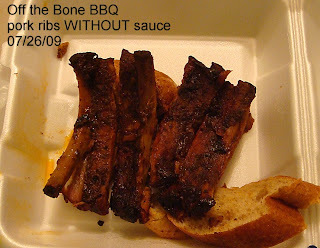 After our first visit a few weeks ago, I really wanted to try the ribs at this place without sauce. I got my chance tonight, at about 1 am, on the way home from a blues gig down the street. $5 gets you 4 pork ribs and I was very specific about NO SAUCE. We managed to wait til we got home to sample, then we ate them all! Yes! They were much better and tastier without their house sauce slathered all on them. I could not detect any smoke flavor, and my guess is that these are slow oven cooked with a generous basteing of sauce caramalizing during cooking. They are genuinely fall off the bone tender. Definitely a good stop and an essential one during late night hours. Just remember to get those ribs dry if you want all that slow cooked flavor to come through. 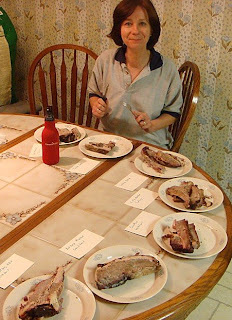 Well the Mrs arrived back home tonight and she did the taste test, too. 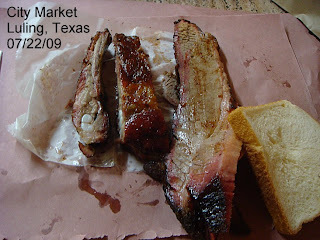 Her scores were: City Market in Luling #1, Black's BBQ of Lockhart #2, and Smitty's of Lockhart #3. 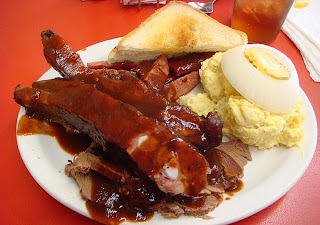 Yes, I'm crazy about BBQ, or maybe just plain crazy. I ran out of delicious Kreuz jalapeno cheese sausage in my freezer so OF COURSE I decided a ROAD TRIP was in order. 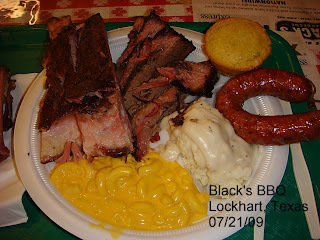 I zoomed down to Lockhart Tuesday night, grabbed a hotel siesta, then moseyed down to Black's for an outstanding BBQ dinner. The brisket was so tender it just fell apart when poked with a plastic fork. It was just crammed with smoke flavor and was truly outstanding, even for Black's, which is always great. I decided I needed more of that brisket so I went back around and ordered another pound to go. I immediately noticed they were carving from a new brisket that was not nearly as smoke charred, but I figured what the hey and took it back to my room and threw it in the hotel mini fridge. I pulled out late Wednesday morning and headed to Luling for round 2 but this time I ordered a "to go" pound at the same time as my lunch. Wowzer. 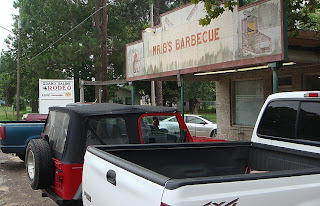 Another incredible brisket and ribs that were durned near as good as North Main. Two outstanding meals and my 500 mile round trip was already more than worth it, but I still had sausage to get! As I packed my Luling brisket in the cooler, it occurred to me that we had never eaten at Luling BBQ which is just across 183 from City Market. By now an evil plot was beginning to form in my smoke addled brain so I sauntered across the main drag and got a pound of brisket from them as well. The plot thickens! They had some great looking pies and cakes in there but I'm going to be very hard pressed to buy BBQ at Luling City BBQ when City Market remains Mount Everest in my book. Next, back to Lockhart, and my evil plan begins to take shape. Even though we have had nothing but bad experiences at Smitty's, I stopped in and got a pound of brisket from them as well. My little cooler was now full, fortunately I still had the big one! On to Kreuz Market to fulfill the original goal of my mission, 3 cases of jalapeno cheese sausage, the best in the world to my taste buds. The boss man hisself filled my order and though he wasn't too keen on it, I did talk him into putting some small bags of dry ice in my boxes to keep that sausage cold all the way to the Big E. Allowing me to put my big cooler to better use! Before leaving, I got an order of brisket and ribs for Scott and another pound of brisket for me and started in filling the big cooler. An hour or so later (after much gratuitous mid afternoon traffic) I pulled into Taylor and made stops at Louie Mueller's and Taylor Cafe, grabbing a pound of brisket at each and a few jalapeno sausages at Louie's. I now had 7 lbs of brisket from 7 top BBQ joints in central Texas. What to do? 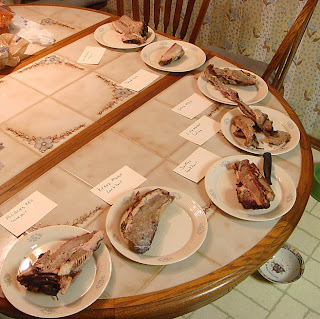 Arrange a brisket tasting party at my house that very evening! 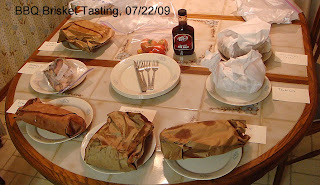 I laid out all 7 lbs and Scott, Nancy, and I sampled from all of them to pick the winer for July 22, 2009. It was no surprise that City Market in Luling killed all the competition. Smitty's made a respectable showing (giving us some slim hope there IS good BBQ there) and Vencil Mares' Taylor Cafe got the honorable mention. I have no doubt if I had gotten my Black's pound from the same brisket as my dinner that they would have been number 1 or a close number 2. That's BBQ for ya!